Herb infused vinegars are easy to make and can turn your salad into a show piece. 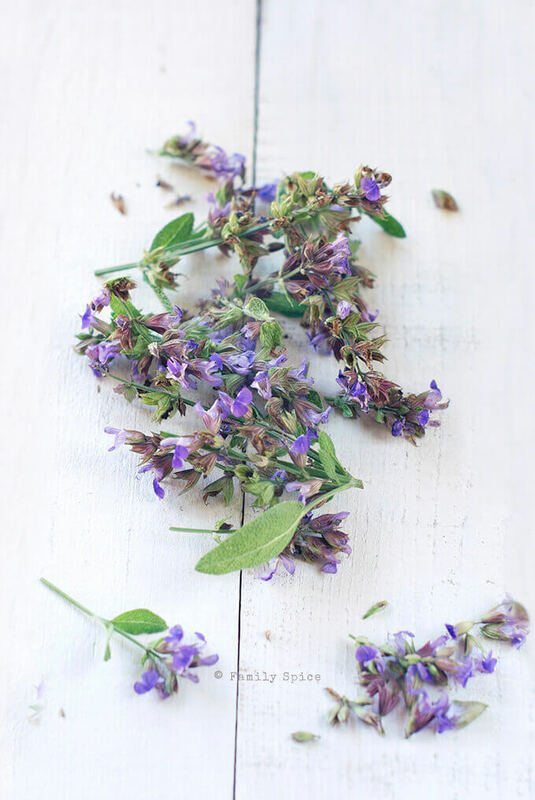 This post features Sage Blossom and Chive Blossom Vinegar. Having a garden in the drought state of California isn’t always easy, especially here in San Diego where we have a bigger problem than up north. We removed our green grass from our tiny yard and now I am reduced to container gardening in the backyard — of course, I’ve been buying a lot of containers. I have focused on filling up my new drought tolerant garden with edible plants – edible in any formation, fruit, leaf or flower. I’m a bit obsessed with edible flowers as they brighten up even the simplest meal. Although I haven’t yet begun planting for my summer vegetable garden, there is one thing I always have growing in the yard – herbs. All kinds of herbs: basil, oregano, thyme, tarragon, mint, parsley and sage. There is something about a sprinkling of fresh herbs to finish off a meal and really bring a meal to life. This is the time of the year where my herbs are happily growing and blooming. I was excited about my abundant chive blossoms that I posted a picture of them on my facebook page. 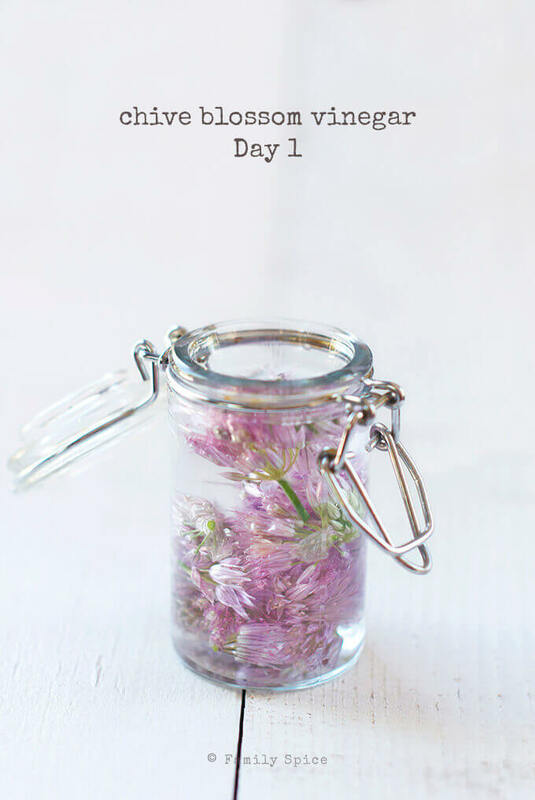 One of my readers told me to make Chive Blossom Vinegar. And that’s when I began to learn more about how to make herb infused vinegars. 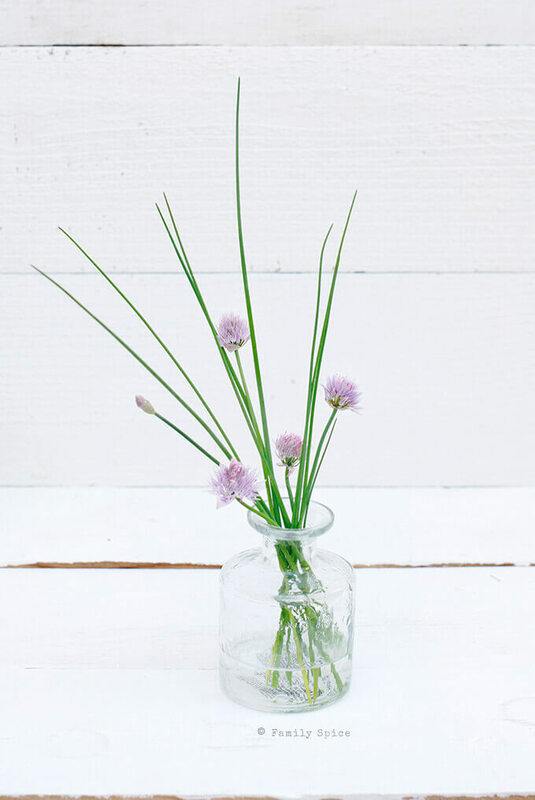 I started with David Liete’s recipe here and quickly realized that although I had a lot of chive blossoms in my garden, I didn’t have THAT many to make a big jar of herb infused vinegar. I had enough for a small spice jar. So, back to the garden I went. My sage plant has grown to a monstrous size, and this year we have gobs and gobs of blossoms on it. So, why not make Sage Blossom Vinegar? The first step of making herb infused vinegars, whether with herbs or the blossoms, is to pluck them and rinse them with cold water. You don’t want any dirt or critters in your vinegar, do you? You then warm up your white wine vinegar, but do not boil it. You want a slow infusion of the blossoms into the vinegar, not a hard shock to completely destroy them. 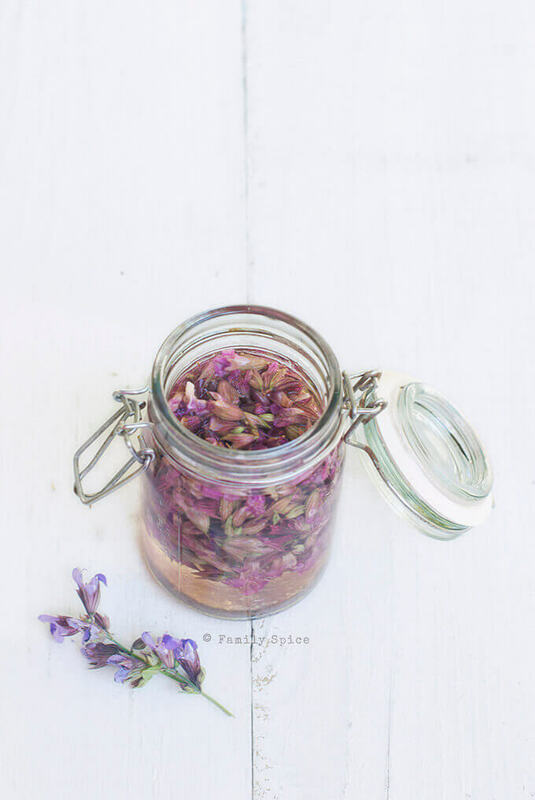 Strain your freshly cleaned herbs and fill your jar with as many blossoms as you can, then pour the warm vinegar in until your jar is full. You will need to push down the blossoms as they float to the top so they can soak up the vinegar. After your vinegar has cooled, seal the lid and wait about two weeks. 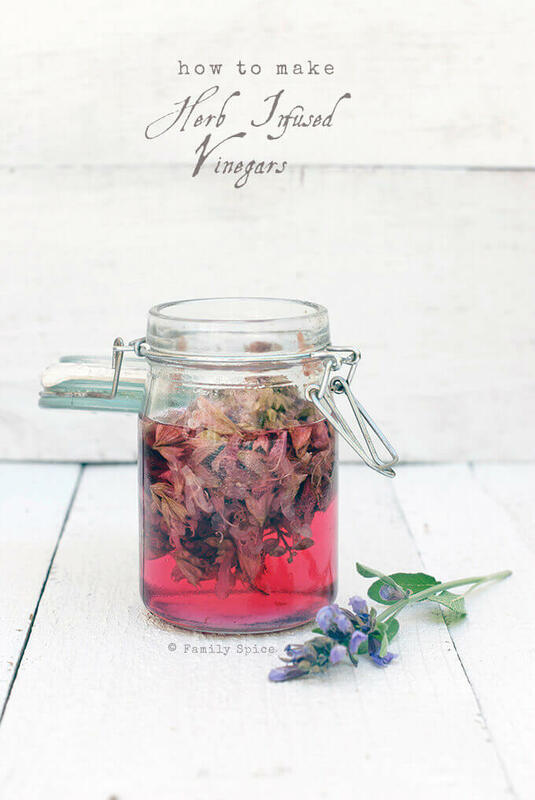 Strain and discard the sad looking blossoms and enjoy your beautiful new herb infused vinegar. The very first picture at the top of this post shows you the glorious fuchsia color the vinegar transforms into after the two week wait. This is my chive blossom vinegar and it produced a gorgeous rosé color. I wish I had more blossoms so I could have made a larger batch of the chive infused vinegar. I had forgotten that my Asian market typically sells chive blossom by the bunch. Next time, I’ll grab it! I used whatever white wine vinegar I had in my cabinet. But, the general thought process is that you should choose a high quality white wine, champagne or cider vinegar for herb infused vinegars for optimal flavor. Avoid using the cheap plain vinegar. You can bet that I will be hunting down more vinegar to use in my next batch! When cleaned, place blossoms in a colander and shake off excess water. 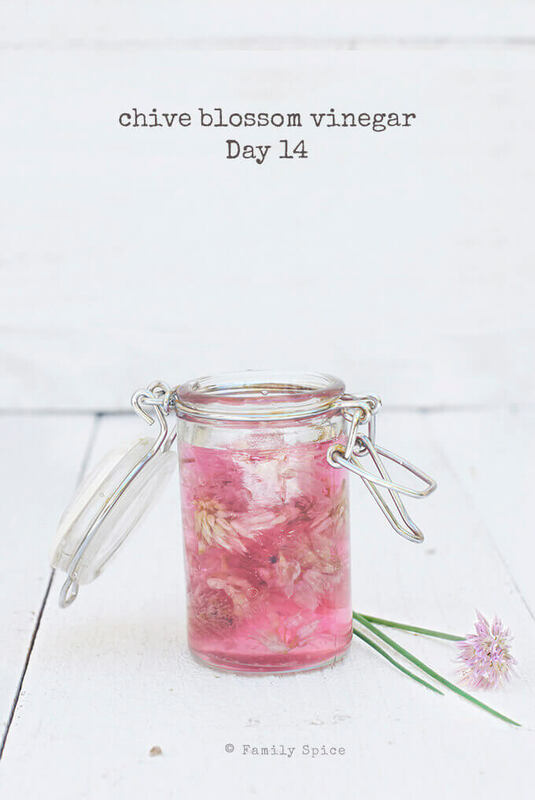 Fill a pint-sized jar with the blossoms and pour enough of the warm vinegar into the jar just to submerge the blossoms. You will need to use a spoon to push the blossoms floating to the top down into the warmed vinegar. Let the vinegar cool completely before sealing the jar. If you have a metal lid, place a square of parchment paper over the opening of the jar and screw on the top. This will prevent the acid from the vinegar to erode the lid of your jar. Place jar in a cool dark place for at least two weeks to produce a vinegar with a strong sage flavor. When you are happy with the strength of your herbal blossom vinegar, strain and discard the blossoms. 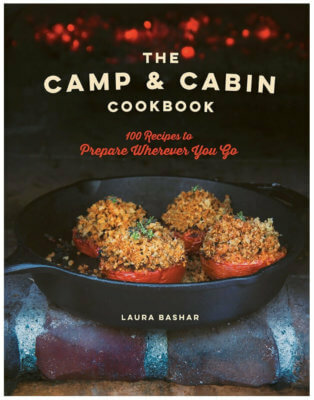 Serving Suggestions: Serve with your favorite salad and vegetables. 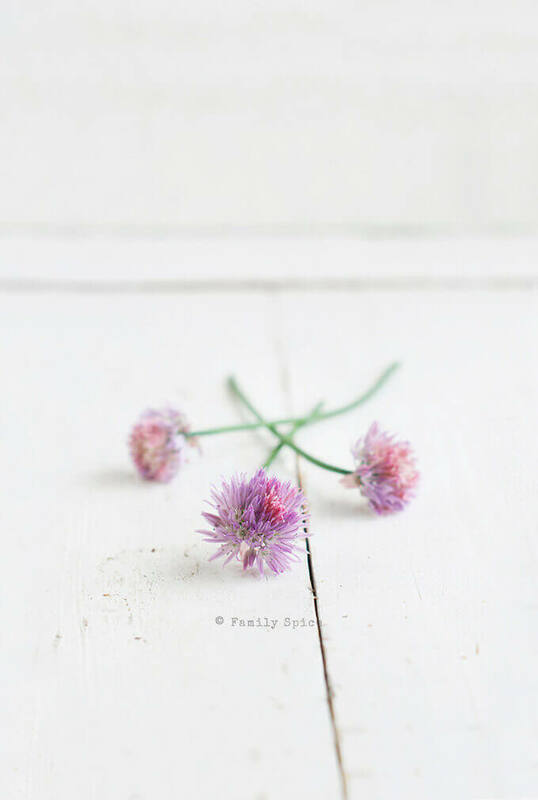 Cooking Tips: Try with other herb blossoms, like chive, garlic and basil. Try using champagne or cider vinegar, too. What a wonderful lesson, Laura! I have bought herb vinegras, but never made them. Come on summer, this year I’ll try! And those photos are absolutely exquisite 🙂 ! A symphony in pastels! Vinegars are wonderful – I can’t get enough. Great idea to go with sage blossoms! I’m currently growing lemon thyme, oregano, basil, mint and rosemary. We also have an abundance of sage in our community garden. I am definitely in the gardening mood in the spring and summer months! And I love my herb garden, too! I need to try these with my herbs! I’ve heard it’s going to be a late and low-yield season for tomatoes with makes me sad… :(. I have 4 potted plants and the Early Girls are just starting to ripen! So I’m not the only one? Whew! We have had to throw out two plants so far. So very VERY sad! Totally impressive! I’m not very creative cook and didn’t even think of this “herb-infused” vinegar. Sounds so lovely~~~~! Great for gift too. It’s like science experiment and it was fun watching how you made this. I know, right? I didn’t think the purple flowers would turn the vinegar magenta! You can use the herbs too, but then it wouldn’t turn into this lovely color. What pretty pictures – love them! And what a great way to use up extra herbs. I would make this just to get the gorgeous flower-filled jars to put on my shelves. ha! ha! I agree! And it’s vinegar, so it will naturally last a long time! Beautiful photos Laura. No gardening for me for several years now. I just don’t have the time since having to tend to Dad. I miss it. I made garlic and basil vinegar some years ago and it was real flavorful. Recently I bought some pomegranate infused red wine vinegar in the grocery store but didn’t find it tasted any different. Very disappointing. Awesome, Kimm! I’m so glad you liked it. It was super easy, wasn’t it?! I feel your pain, we have had terrible weather this year in England and my garden has suffered terribly as a result. I love the idea of making vinegar infusions. I am off elderflower picking this afternoon to make some elderflower cordial and I think I might also see how it tastes as a vinegar. Thanks for the inspiration. For me to inspire you Greg, is a true honor! Like everyone else, I’ve bought infused vinegars but have never made my own. I can’t wait to try this. This looks lovely! What will you use it for? If you’re interested in more ways to use sage blossoms, click on over to my blog for sage blossom simple syrup (for seltzers and cocktails) and sage blossom jelly! I think it’s the acid that keeps the pink of the blossoms, I had the same experience with lemon juice. You can use the vinegar as you would normally, in a vinaigrette with salad and vegetables! I love herb infused vinegars. But I’ve never tried making them. So simple! Definitely on my to do list. Thank you. My herbs are also doing well. and I’m going into my garden to pick my favs for your vinegar ideas! i am inspired. I have recently made some apple cider vinegar…can I infuse this instead of buying white wine vinegar? Yes, you can use cider vinegar, too. It will have a fruity-herbal profile after infusing. Can I use dried sage to make the vinegar? Yes, you can use dried herbs to make infused vinegars. You do not need a lot compared to fresh herbs. But, you will not get the pink color as pictured from dried herbs like you would using fresh herb blossoms.